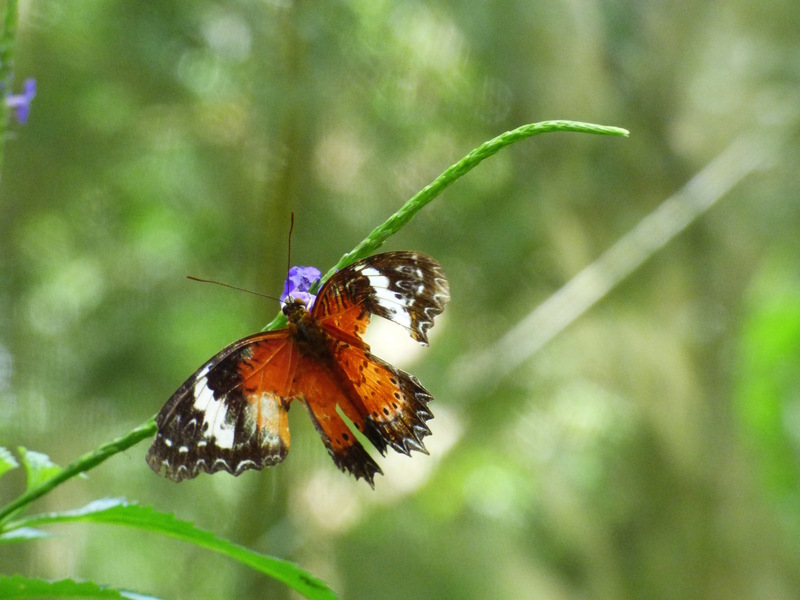 The sweat streamed down my face as we hiked through the jungle to look for our orange-haired cousins who, despite the resemblance, bear no relation to our current president. 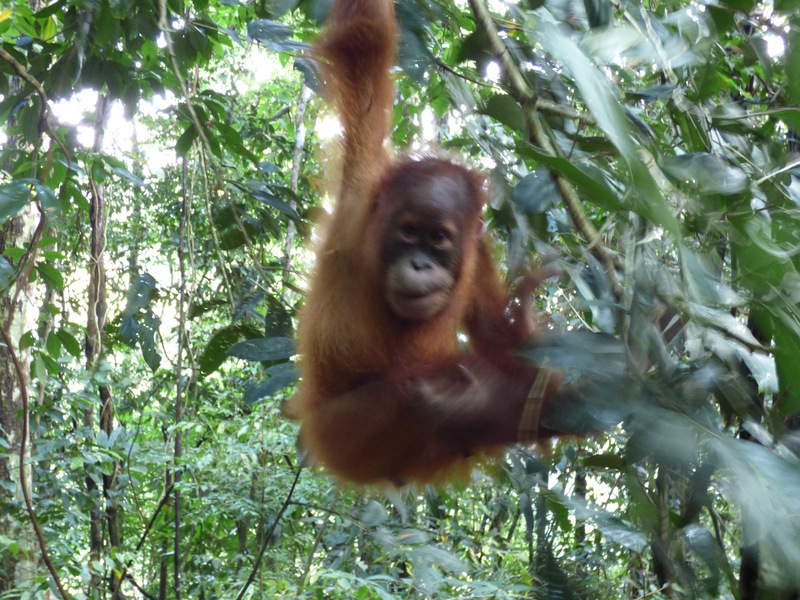 It took less than an hour of hiking through the orangutan reserve on the edge of the town of Bukit Lawang in northern Sumatra to come across a youngster swinging on the vines alongside the trail. 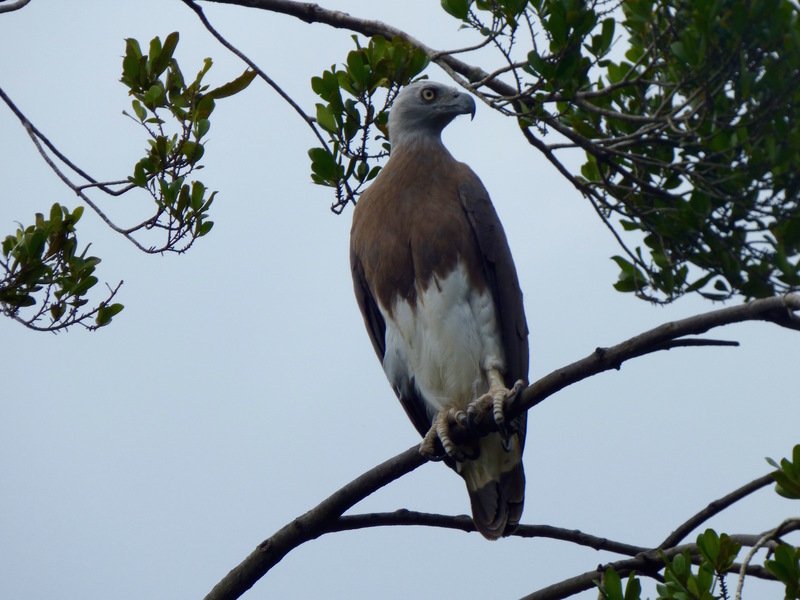 His mother, draped on a branch about 20 feet above us, watched him, and us, to make sure we didn’t get too close. 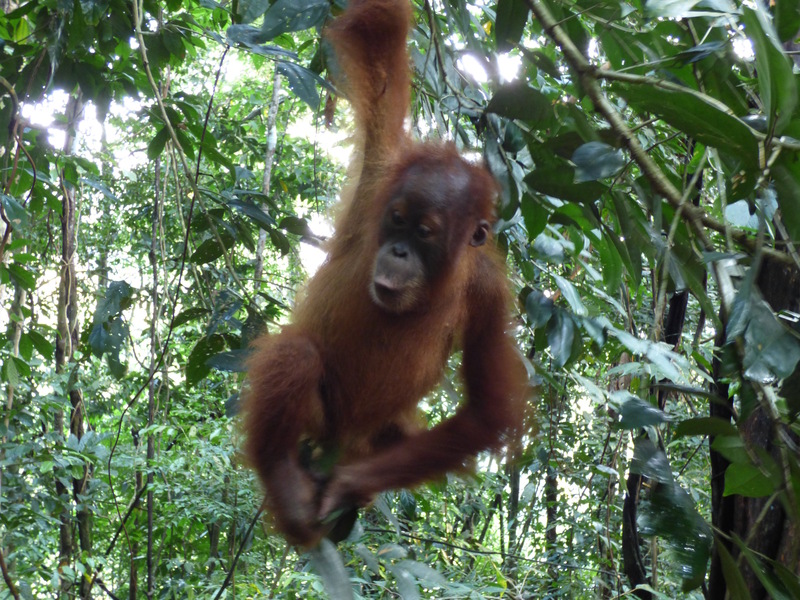 He was an especially playful primate. His nonstop activity often brought him as close as a couple of feet. I have loads of blurry photos since he rarely stopped long enough for a good shot. 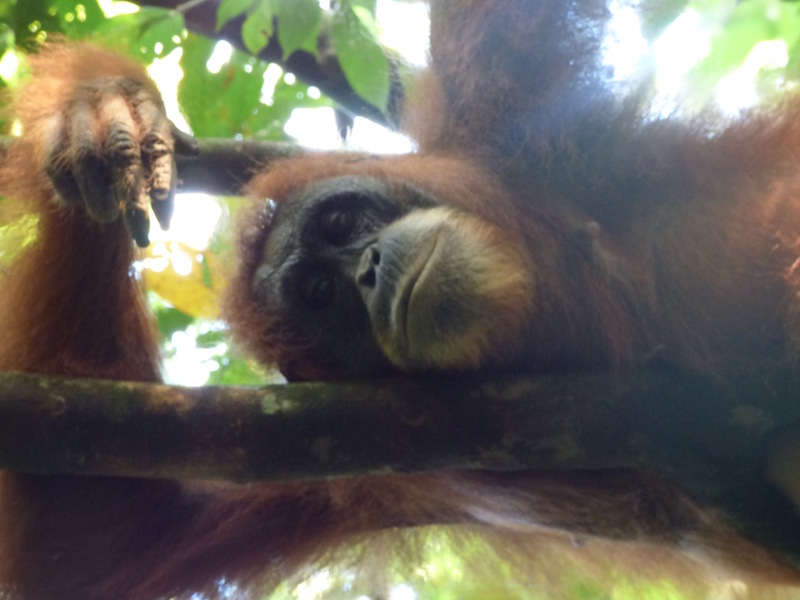 This was only the second day of our three week trip to Sumatra run by Eldertreks, my host for the trip, an adventure travel company specializing, as its name suggests, in exotic trips for mature travelers. 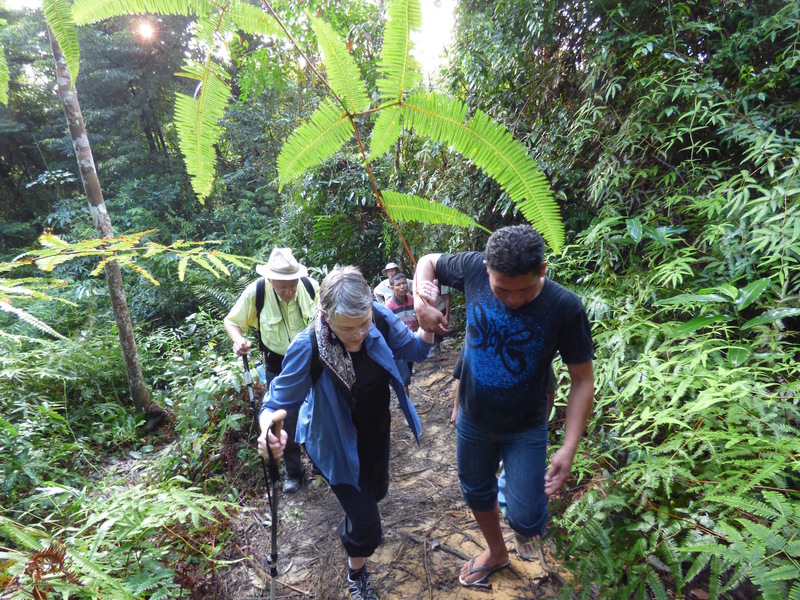 The age range among the seven travelers in our small group was early 70s to early 80s — a fit, active group that belied the advanced age of its participants. After that we headed out in 4WD jeeps on one of the worst two hour plus drives of my life. The road was rough, rutted and dusty and I spent much of the time hanging on for dear life. Along the way we passed through several villages, including the venue for a Moslem wedding. We stopped to pay our respects to the bride and groom and reluctantly turned down an invitation from the proud father of the groom to join them for the reception. But lunch awaited us further down the road. 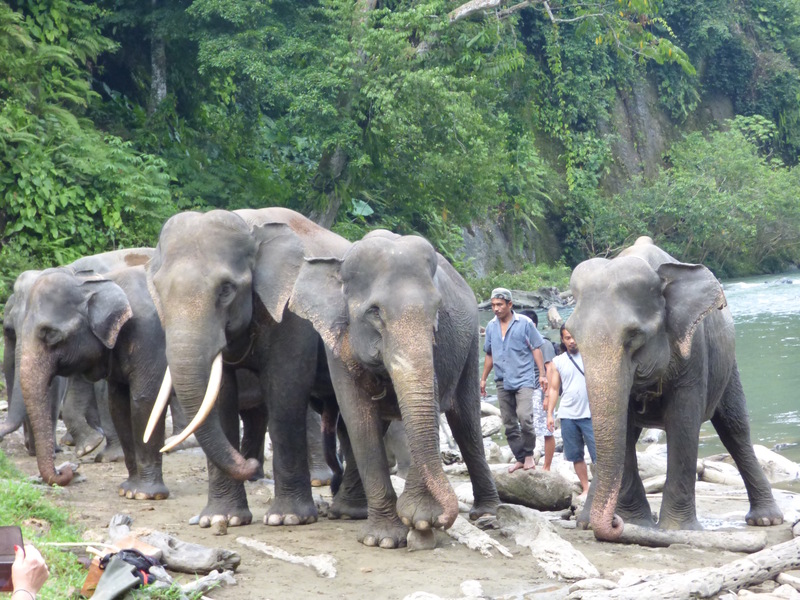 The reward for two hours of bouncing and breathing dust was elephants. A family of several, including two babies, approached us from across a river. 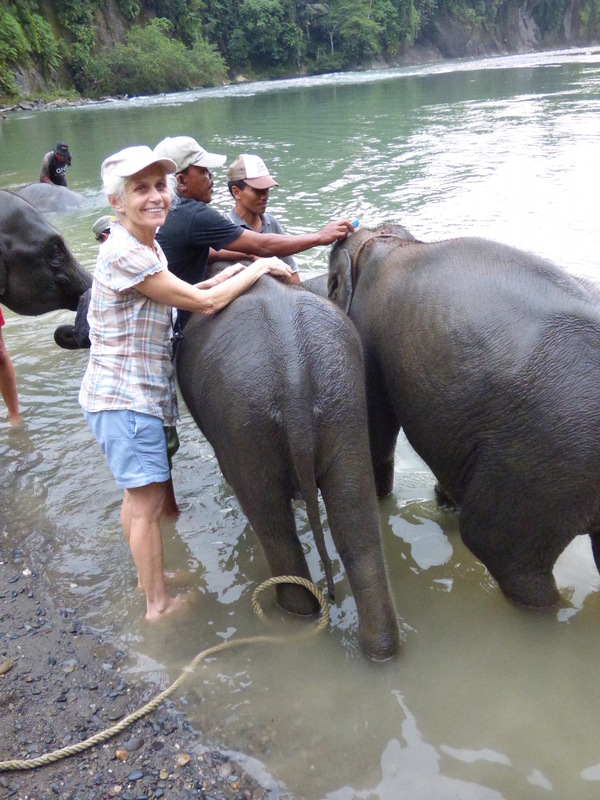 The mahouts offered us brushes and the opportunity to scrub the elephants. Of course my wife, who has yet to meet a wild animal she doesn’t fall instantly in love with, grabbed one of the brushes and scrubbed away on one of the babies, to whom she seemed especially attached. 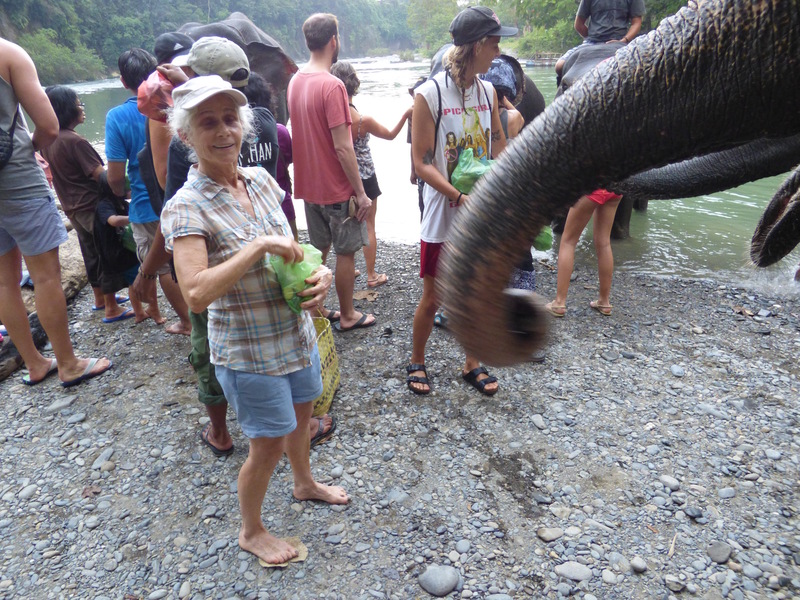 I got as big a kick watching her scrub the “little” guy as I did watching the elephants play in the river and spray the tourists standing on the beach. This was clearly a day for watching mammals at play. 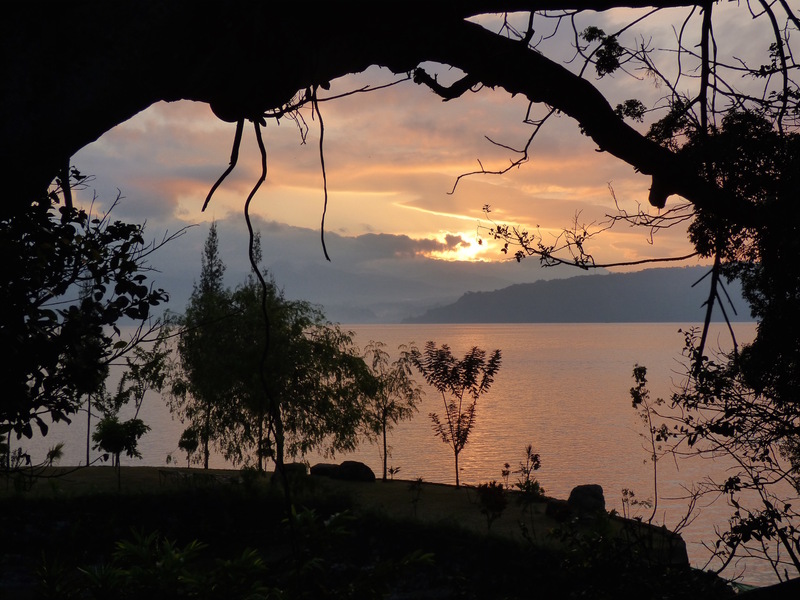 The following day we left for our next destination, Lake Toba, the largest lake in SE Asia. The lake was formed about 75,000 years ago in the most powerful volcanic eruption of the last 25 million years, many times greater than Vesuvius, Krakatoa, or Mt. St Helens. 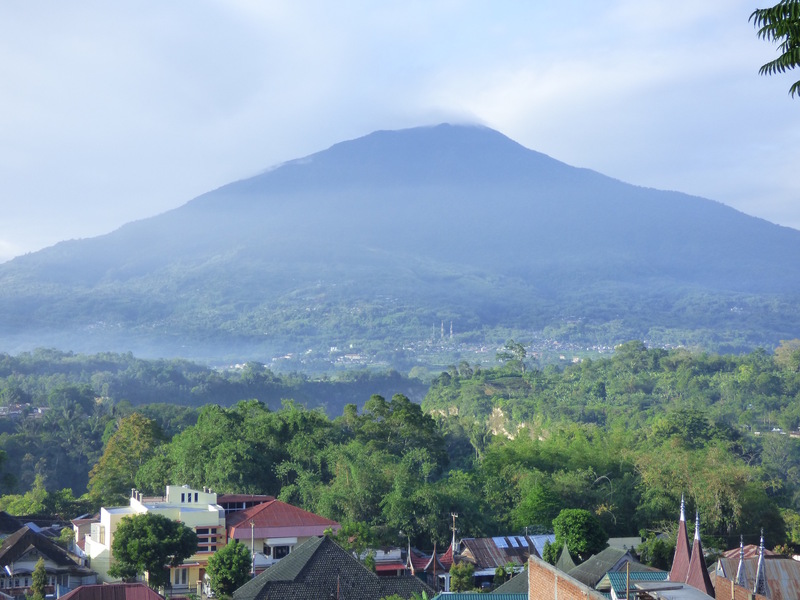 The two day drive took us through lush, cone-shaped volcanic hills (more in Indonesia than anywhere else in the world, including, gulp!, many that are still active), fertile fields of coffee, oranges, cabbages, beans, corn and chilis, the legacy of the volcanic ash. 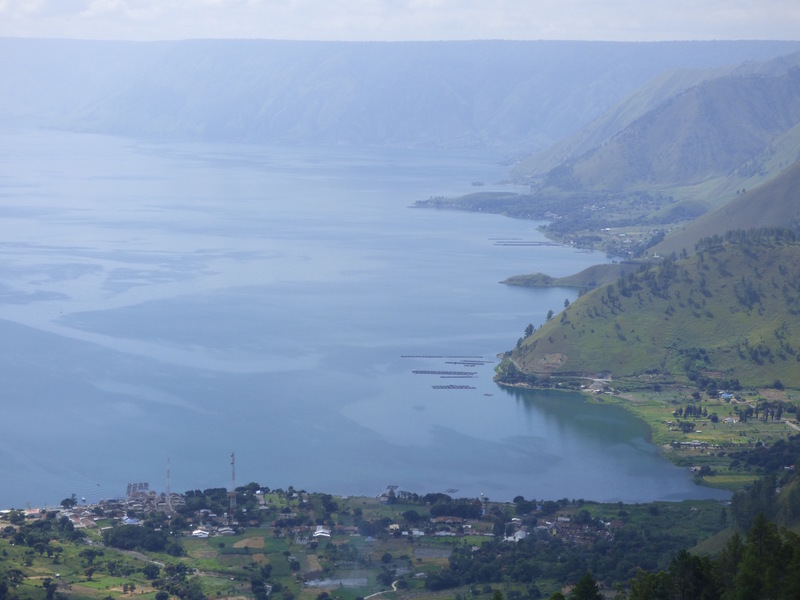 We got our first glimpse of Lake Toba from a viewpoint high above the lake. 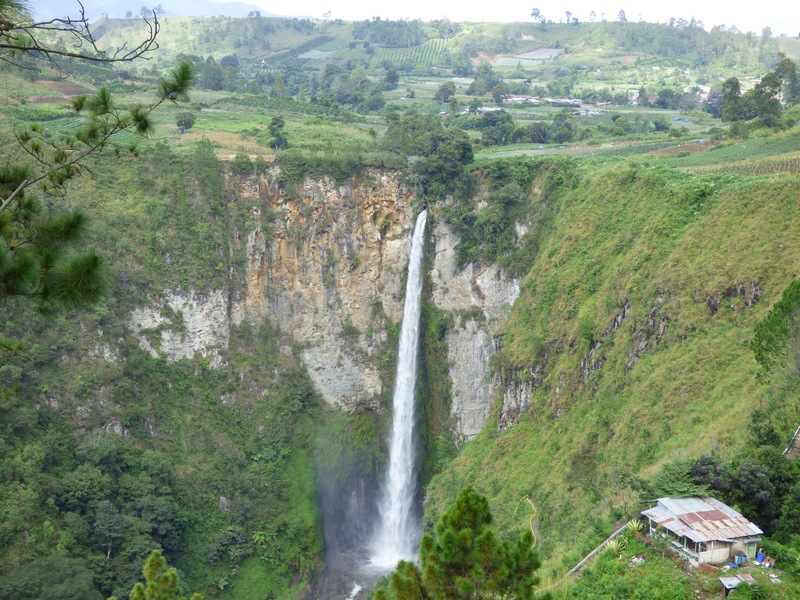 From the viewpoint we could also see Sipiso-piso, a 210 meter waterfall. 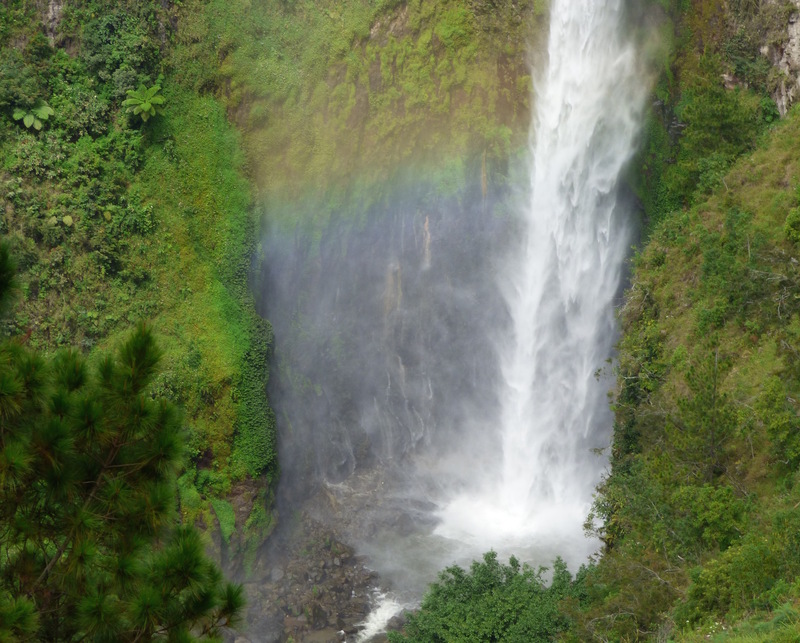 When the sun peaked out from behind the clouds a rainbow emerged in the mist from the water crashing in the pool at the bottom of the fall. 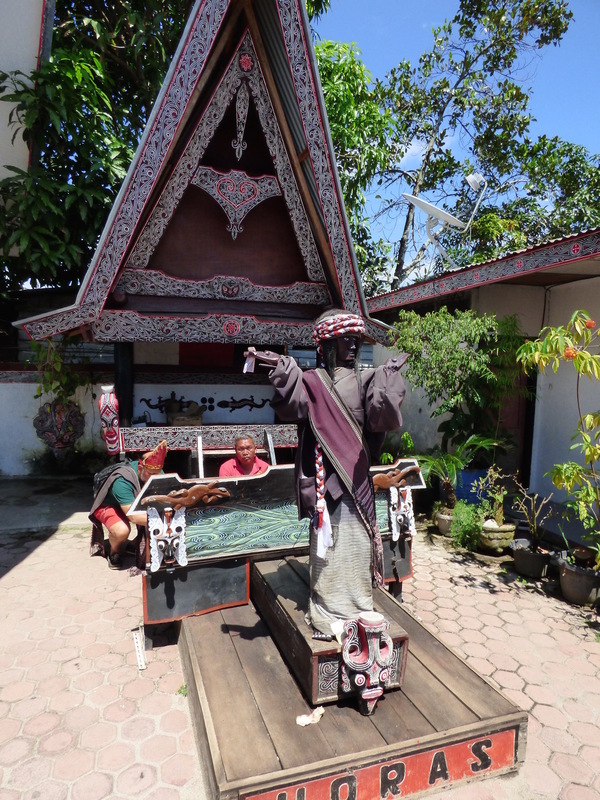 Our stop for the next three days was the village of Tuk Tuk, on the water’s edge on Samosir Island in the middle of the lake. 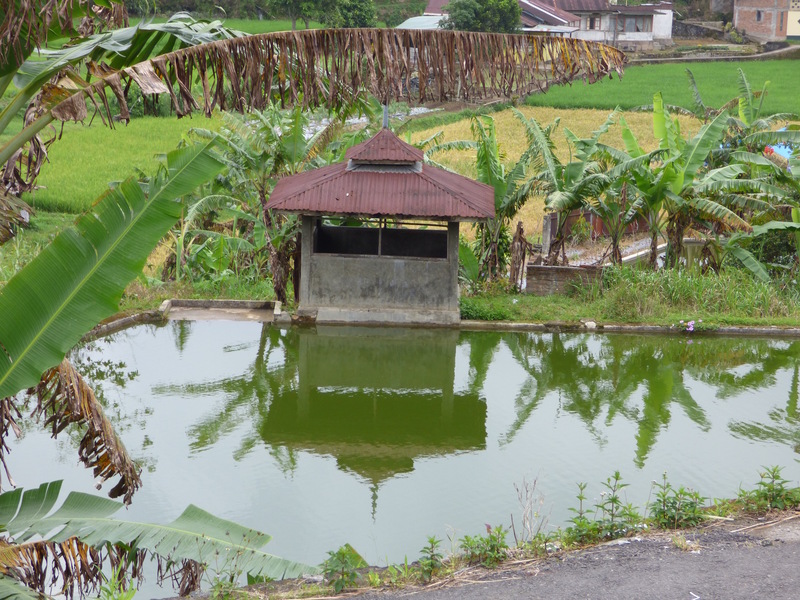 On our first full day we took a leisurely boat ride to explore a couple of nearby villages and historic sites of the Batak people, the largest ethnic group in northern Sumatra. The highlight of the day for me was one of the most bizarre performances of music, dance and puppetry I have ever seen. For someone whose musical preferences include avant-garde and experimental jazz, this pushed even my musical envelope. The music featured heavy percussion and a high-pitched reedy flute. But the music was not the only source of weirdness. While the music played, a guy danced – mostly hand movements – and another guy operated a life size puppet that replicated, sort of, the hand movements of the dancer. Like I said I like weird music and performance, so I was enthralled by the whole experience. All I needed were some of the magic mushrooms openly advertised on prominent signs in front of shops throughout Tuk Tuk, a popular stop in the global hippy trail back in the day. Lunch was at “world famous” Jennie’s, or at least world famous to travelers to this part of the world. 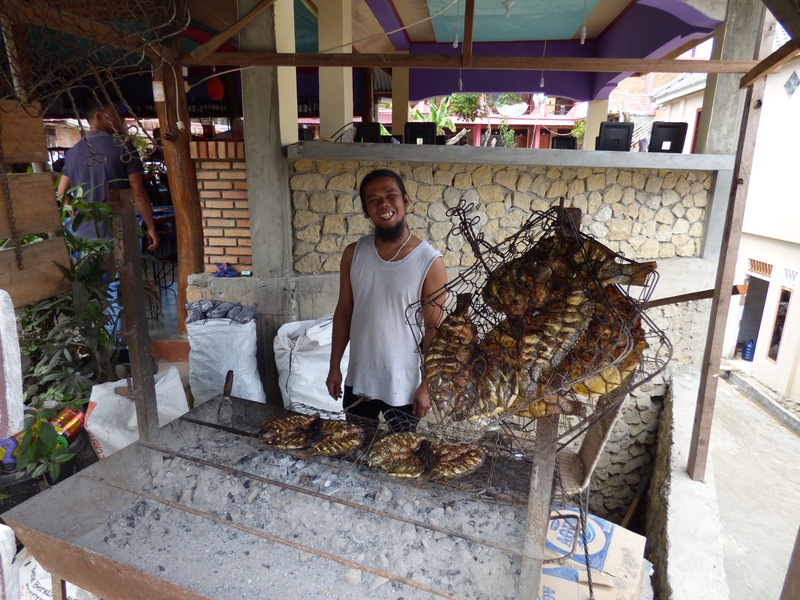 Jennie is famous for her fish, caught fresh from the lake and grilled right in front of the restaurant. It was one of the best meals of the entire trip. 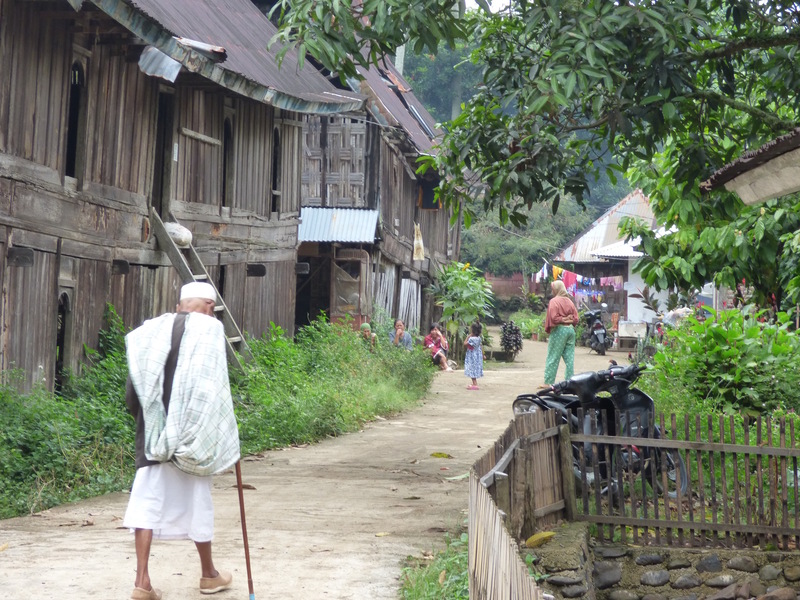 After we got back to Tuk Tuk we walked through the village to the home of one of the housekeepers, Rose, at the cottages where we were staying to get a taste for what life is like for a typical resident of the island. Home visits are often awkward. Visitors may feel intrusive and patronizing, hosts can feel intimidated by large, loud Westerners. This visit was nothing like that. Rose’s kids helped. In general, the kids we saw or met throughout the trip were among the warmest, most engaging and charismatic kids I have come across in my travels across the globe. 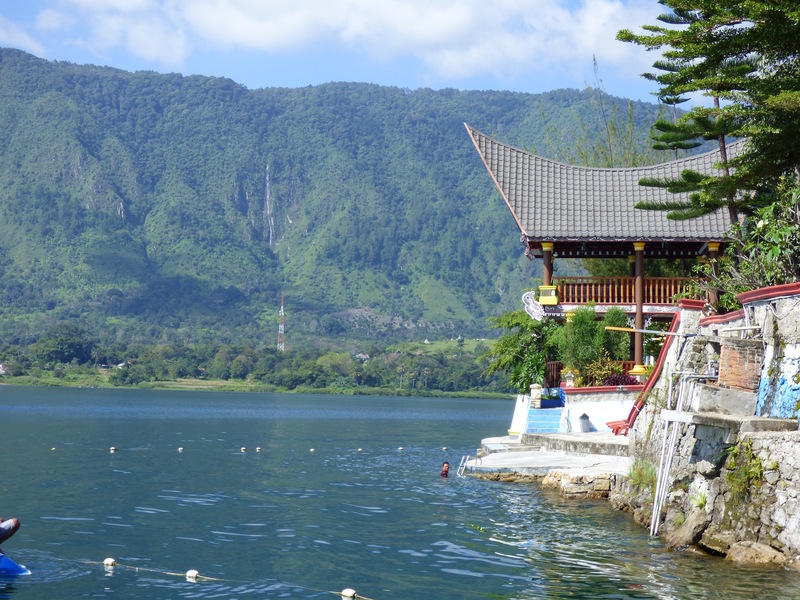 Our last full day on Samosir featured a leisurely three hour walk looping through Tuk Tuk from end-to-end, broken up by a lunch of local lobster at Widya restaurant. The lobster were small, sort of like large langostinos or maybe an even larger crawfish, but 2 or 3 each were more than enough to fill us up. We left the next morning for two very long, but scenic days of driving, most of it on bad roads. 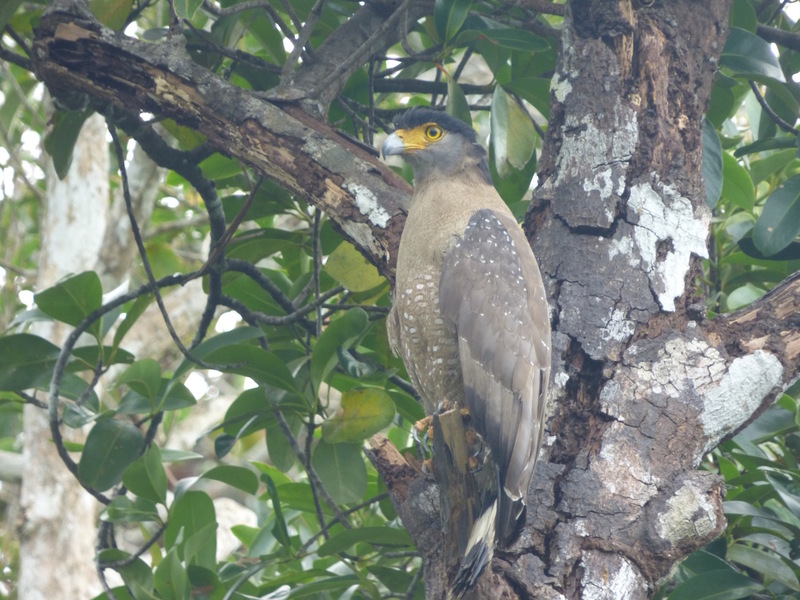 At least the scenery – long dark tunnels of green, steep volcanic slopes covered in tangled jungle, rice paddies, mosques with shining onion domes, rivers winding through terraced mountains and tropical forests — gave us something to look at as we squirmed in our seats at around the 6th or 7th hour of the drives. The drive also took us through villages, giving us fleeting glimpses of everyday life — houses right against the road, women in colorful head scarves sweeping their stoops, children in school uniforms waving to us on their way to school, men fixing trucks in their front yards, people selling all kinds of stuff from stalls in front of their homes. 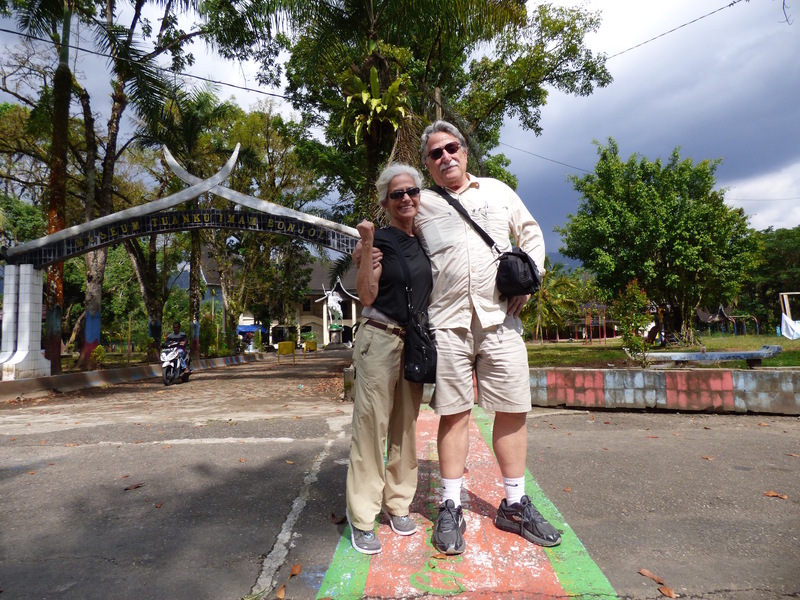 At one point we crossed the equator and stopped just long enough for the obligatory photos straddling the Equator with one foot in each hemisphere. 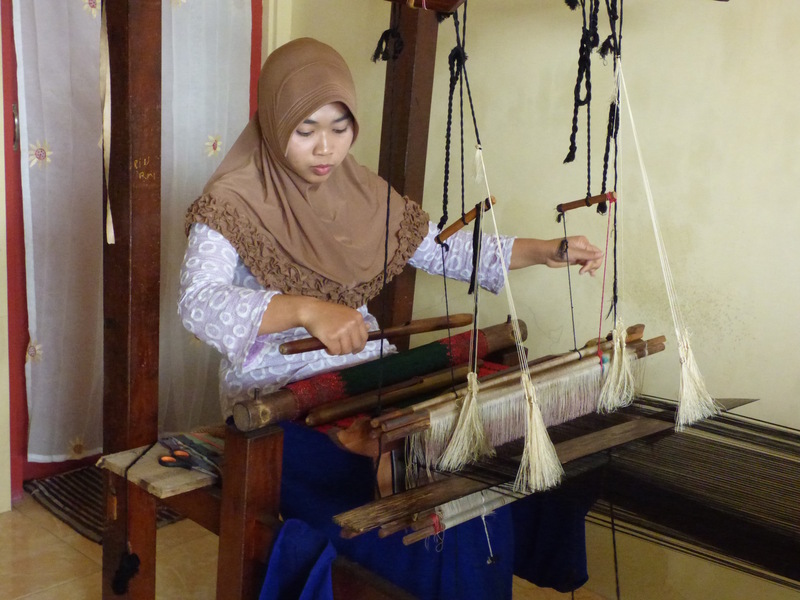 Our next stop, Bukittingi in Western Sumatra, was a pleasant surprise. 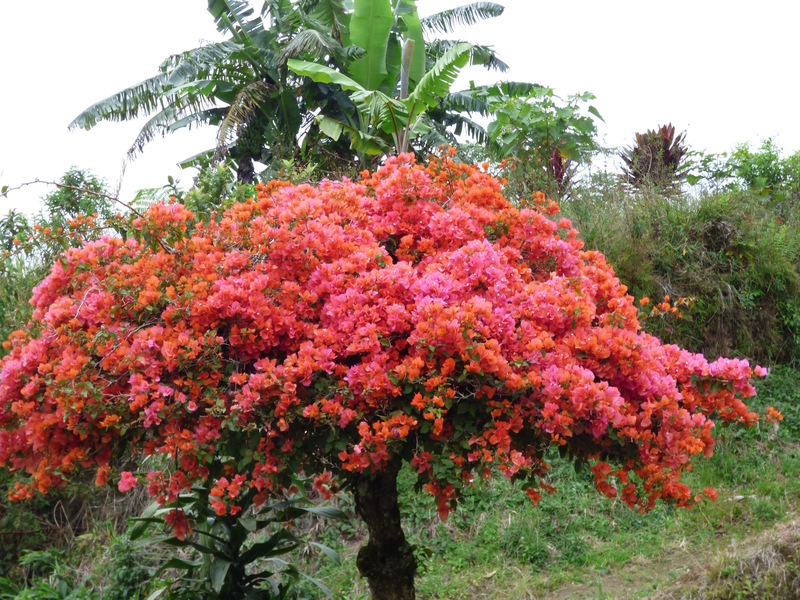 At 3000 ft above sea level nestled between three volcanoes, Bukkitingi has more to offer than cooler temperatures and pleasant scenery. We checked into our fancy hotel, The Hills Novatel, and took a short walk to the plaza near the hotel, the site of the clock tower, the most famous attraction in Bukkitinggi. It was Friday evening after the weekly Moslem services. The plaza was full of people enjoying the early evening. Young Moslem girls in hijabs shyly giggled as they approached us, holding their hands over the mouths wanting to pose for photos with us. Everyone was friendly, welcoming, and curious, asking us “where you from?” I felt like a rock star. I guess they don’t see many fat, old Jews in this part of the world. 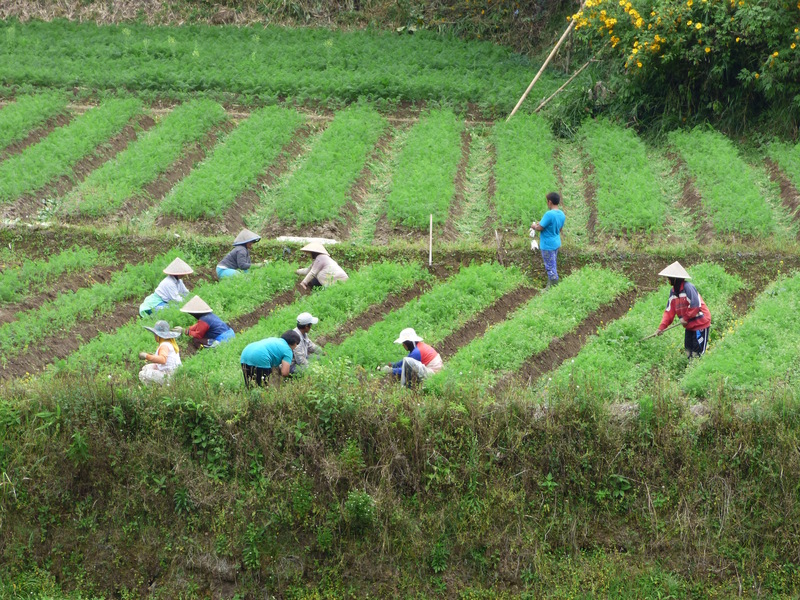 The next day we walked seven miles through rural villages outside the town, once again giving us a glimpse of everyday life as farmers with their water buffaloes planted and tended their fields of rice, chilis and sugar cane or tended the fish they farmed in artificial ponds in front of almost every house. 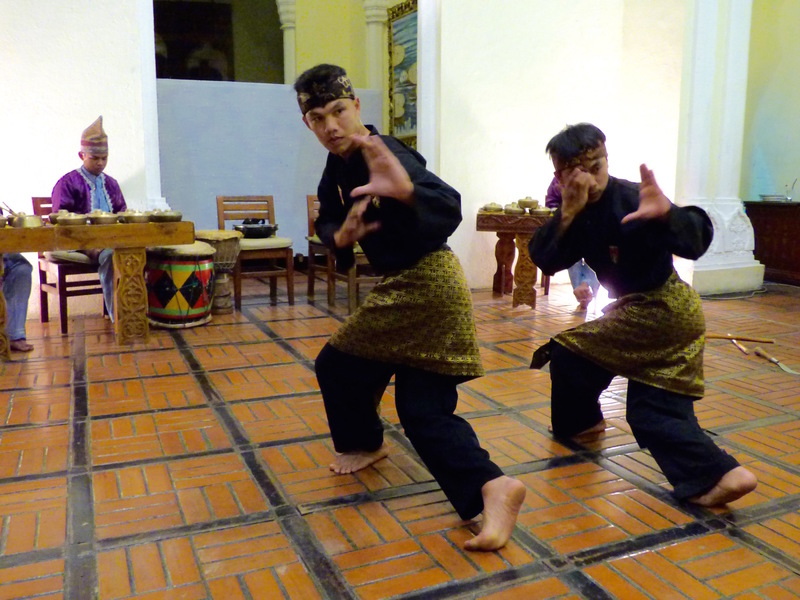 That evening we were treated to a performance of traditional and contemporary music and dance. 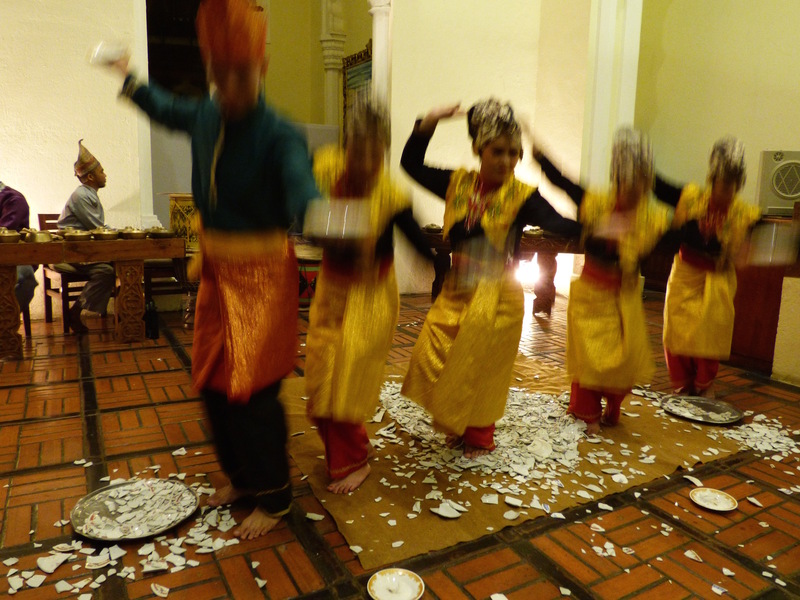 It concluded with the bare-footed performers stomping on broken crockery. They were so forceful and enthusiastic that the shards flew all over the place. I had to jump out of the way. As far as I could tell, no one was bleeding after the show. The next day we got a heavy dose of Minangkabau culture, the ancient matrilineal people who dominate this part of western Sumatra. 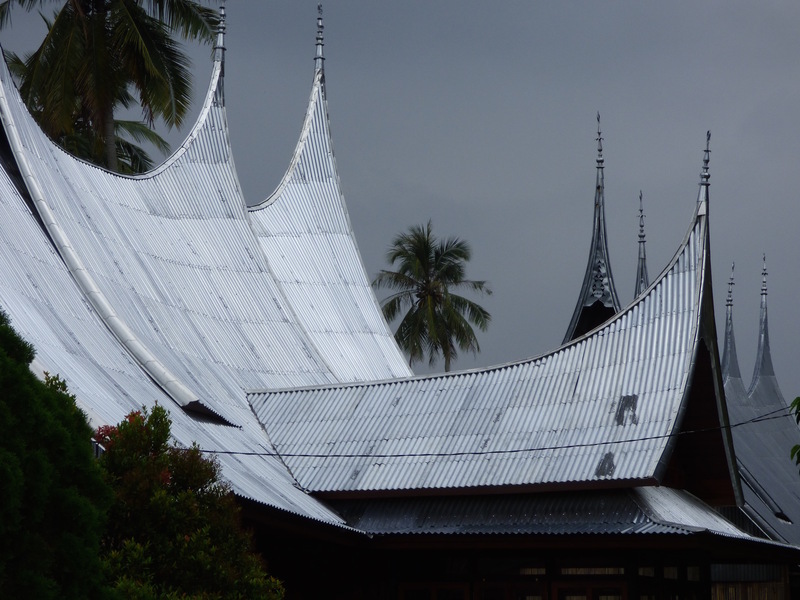 First was a visit to the beautifully restored royal palace, with its swooping pitched roof shaped like a saddle coming to needle points at the ends and other points along the roof line (supposedly resembling buffalo horns). Not a good place for ballooning, sky-diving, base jumping and other sports that involve landings that are only partially controlled. 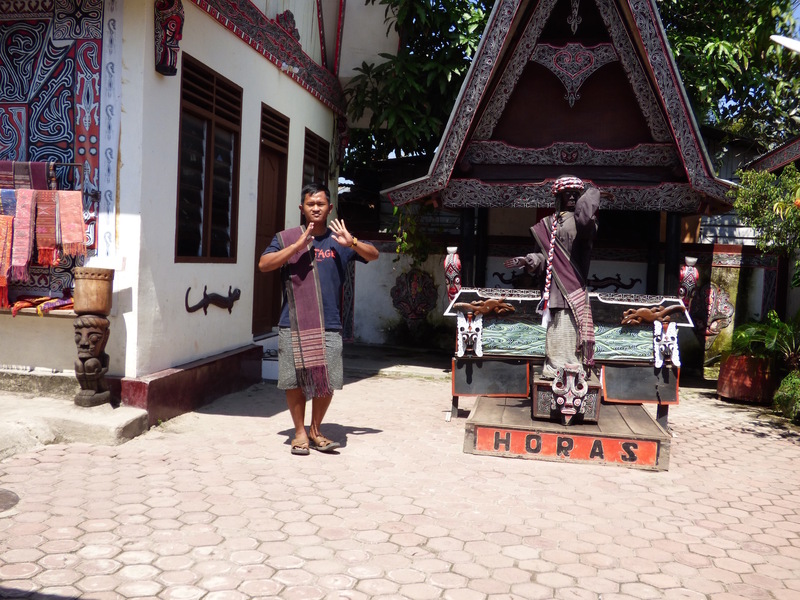 This was followed by a visit to a traditional Minangubau village and to a classic style home in that village, a long dark wooden structure that probably hasn’t changed much since it was originally built many years ago. The residents of the house greeted us warmly and showed us around. They smiled at us the whole time we were there as if they actually enjoyed having eight large white people invade their privacy. Our guide assured us that the warmth was genuine. 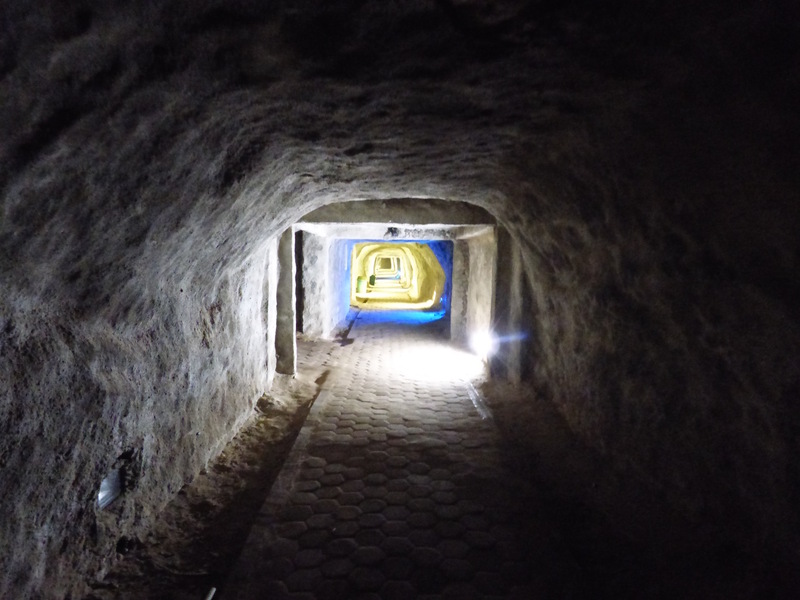 On our last day in Bukittingi we explored the nearby Japanese Tunnels, which the Japanese built using local slave labor during their occupation during WWII. The tunnels end in Sianok Canyon – not a Grand Canyon by any stretch of the imagination, but a pretty good canyon, and one that is considerably easier to hike. After more than two hundred sweaty and wind-sucking steps we made our way up to the rim on the other side. We walked a bit farther then got on our bus for a short ride to a local silversmith where Katherine did her best to aid the local economy. 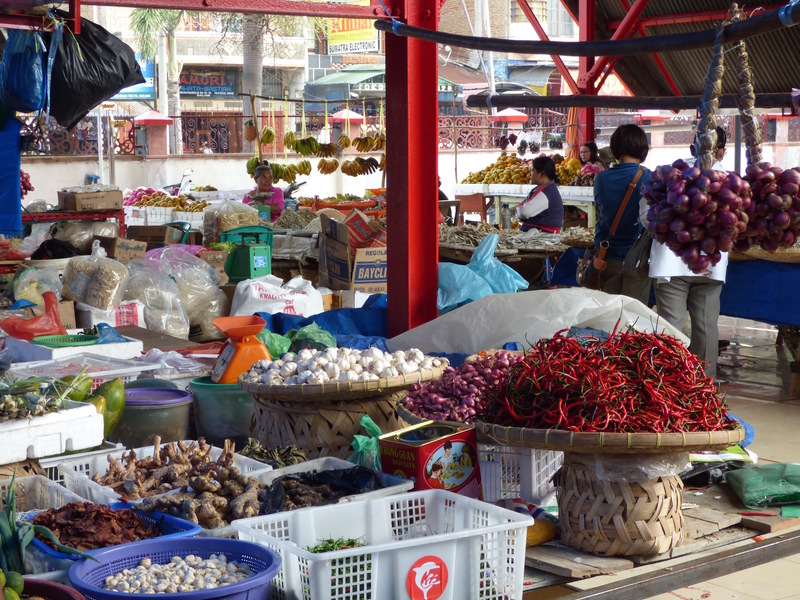 A short flight to Jakarta and a 90 minute bus ride took us to Anyer, a beach town on the Sunda Strait between the Indian Ocean and the Java Sea. The Aston Anyer Beach Hotel was everything that you might expect from an upmarket beach resort – great pool, beach access, and rooms with a view. Apparently this is a popular destination for well-healed residents of Jakarta (otherwise known as “the Big Durian”) and ex-pats looking for a retreat from the madness of Jakarta. 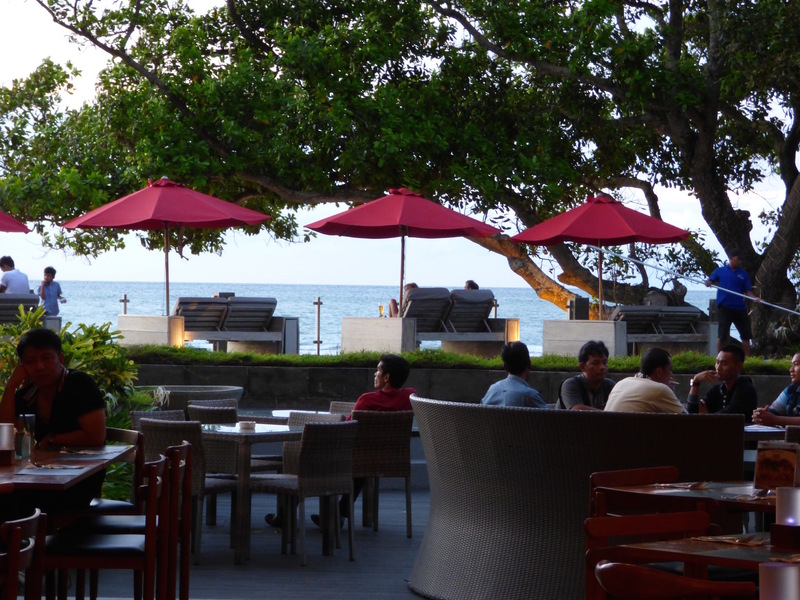 It was a great place to chill out for an evening before heading back across the Strait to Sumatra by speedboat. 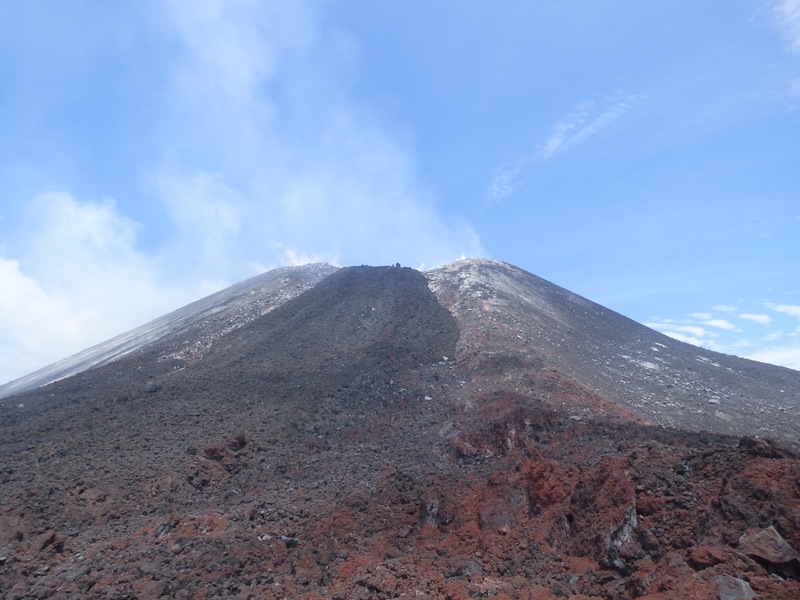 But first we had an important stop to make -– the legendary volcano, Krakatoa. Krakatoa’s eruption in 1883 was probably the single greatest destructive force in modern history. 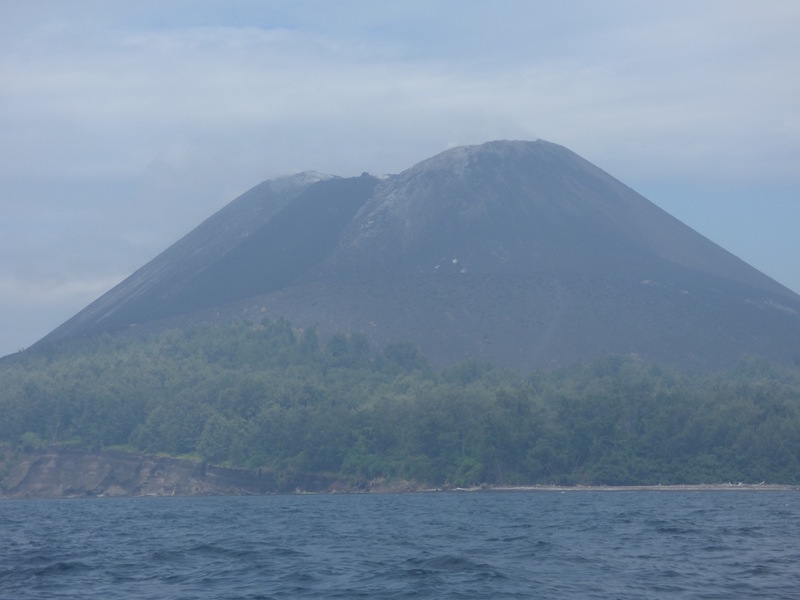 All that is left of that earth-shaking volcano (literally) is an arc of islands that used to be part of the rim of the original caldera. 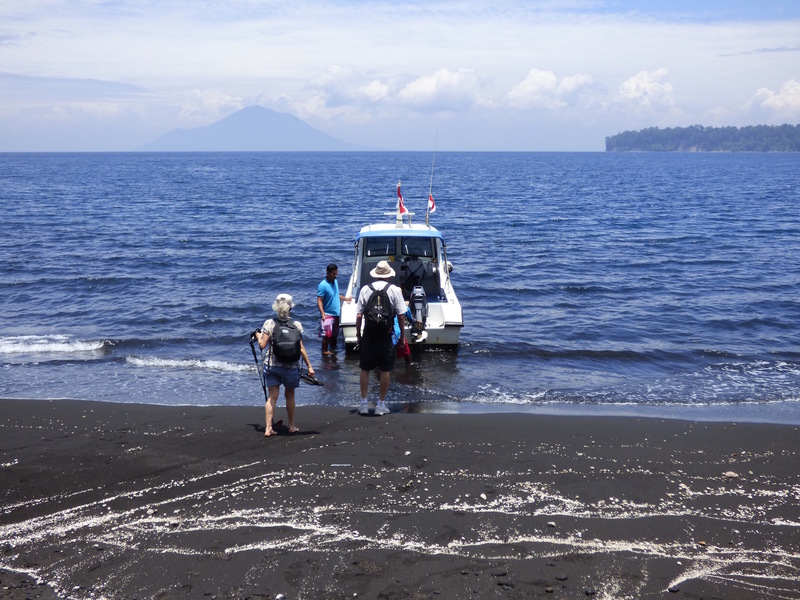 Anak Krakatoa (“child of Krakatoa”) a volcanic island that emerged in the middle of the original caldera in 1927 was our destination. 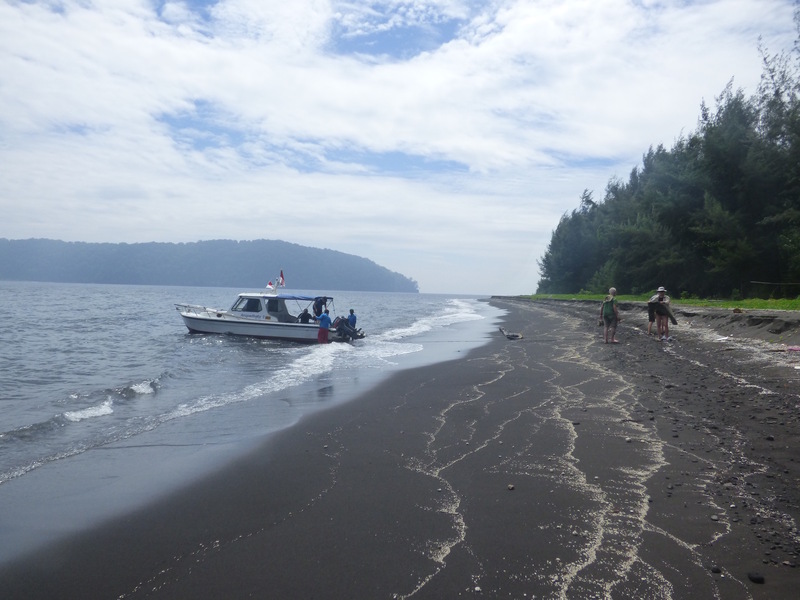 A rough and wet two hour ride in the speedboats deposited us on a black sand beach on the island. We hiked through the tropical brush covering the lower portion of the island to an exposed expanse on the volcano’s flank. 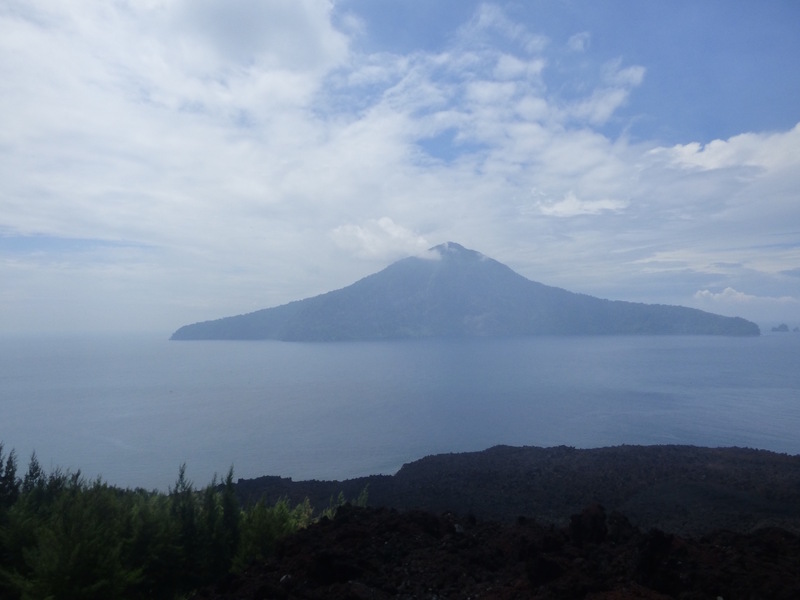 For a few minutes we hiked further through the harsh rocky landscape to a viewpoint where we could see steam and smoke drifting out of the caldera at the top, plus the remnants of the original caldera which now appear as islands with steep walls of jungle not that far away. It’s absolutely stunning. In one direction we looked at a rocky lunar landscape, in the other a sea view studded with steep, lush islands. Just the idea of where we were, let alone the actual views, was enough to blow my mind. 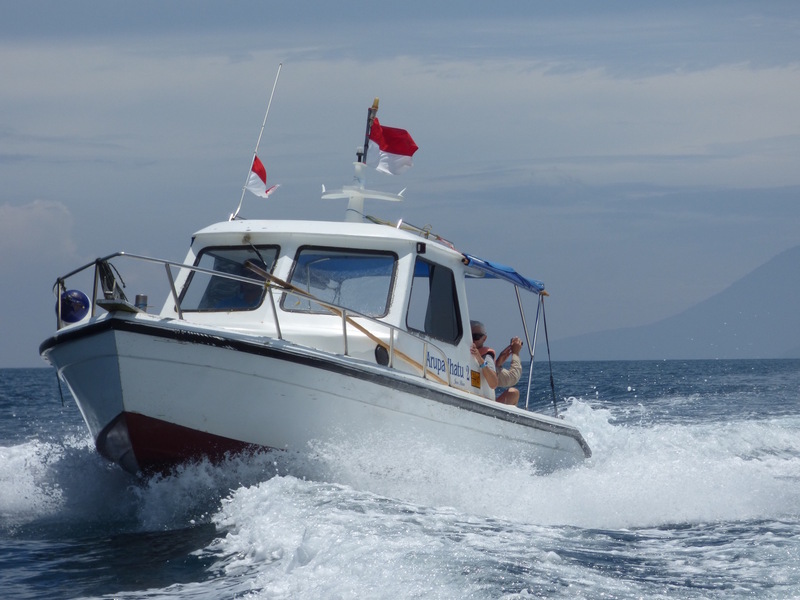 We then headed back to the boats for a short trip to another island for lunch. 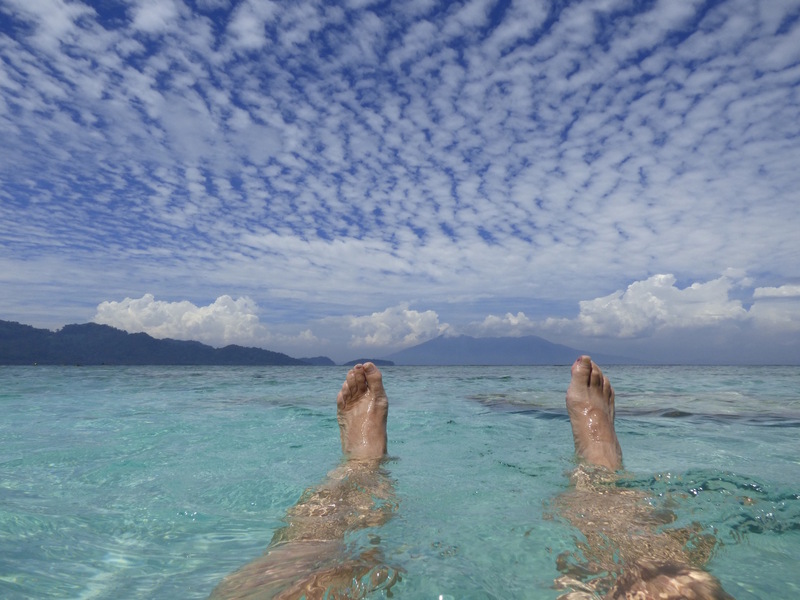 The white sand beach, clear, warm water, and spectacular views of sea and tropical volcanic islands put the cap on the day as I floated under a sky of crenulated clouds. 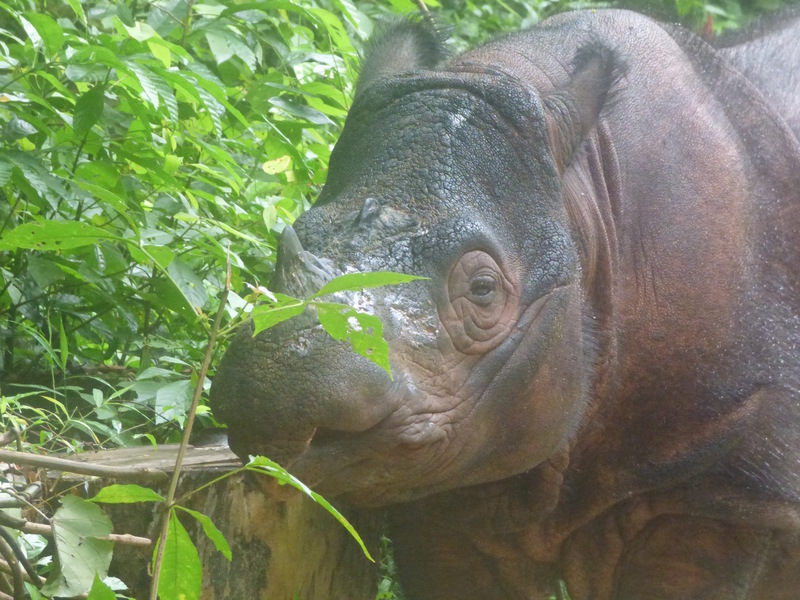 After a night in the most luxurious hotel of the trip, the Novatel in Lampung, we left at 4 am for the Rhino Breeding Center in Way Kambas NP to get there in time for the morning feeding. 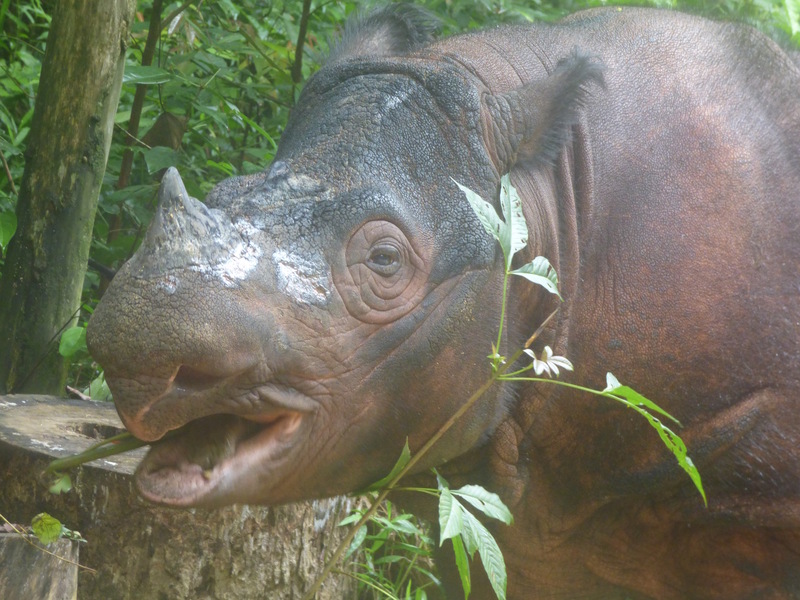 We were met at the entrance to the Center by the veterinarian who explained the challenges of caring for what is arguably the rarest animal in the world – the Sumatran rhino also known as the pygmy rhino because of their relatively smaller size (“relatively” is the key word here. They still weight close to a ton). 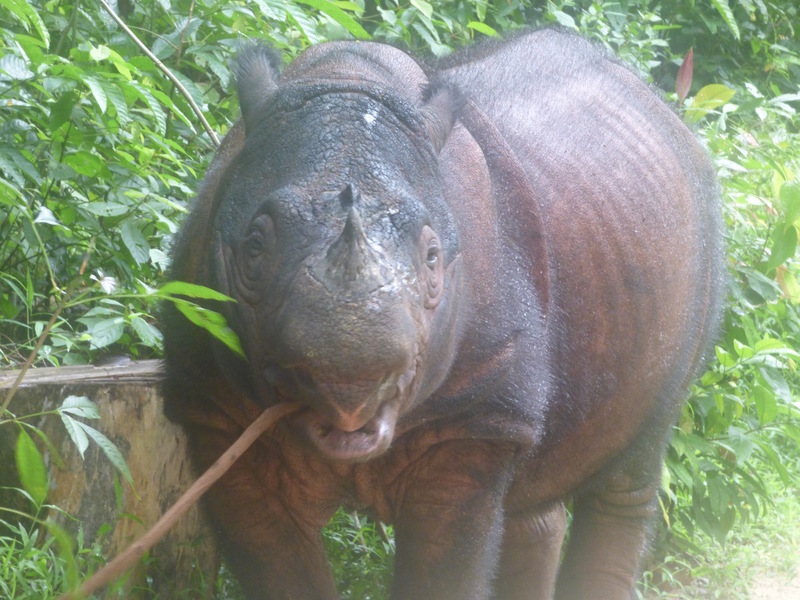 There are less than 100 pygmy rhinos total in the world, all of them in Sumatra. 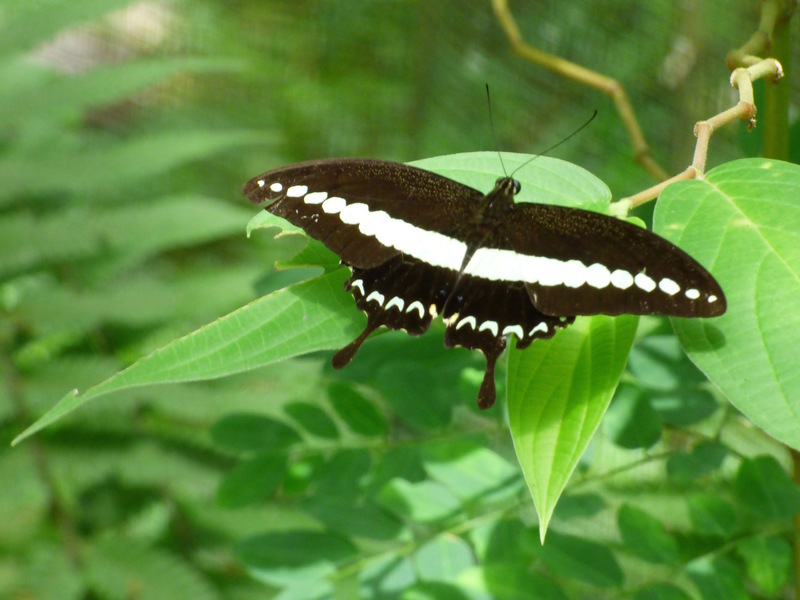 One third are in Way Kampas, and seven of them at the moment are in the breeding center. As the name suggests, the main function of the breeding center is to get the rhinos to mate – not an easy task, for reasons too complicated to go into here. 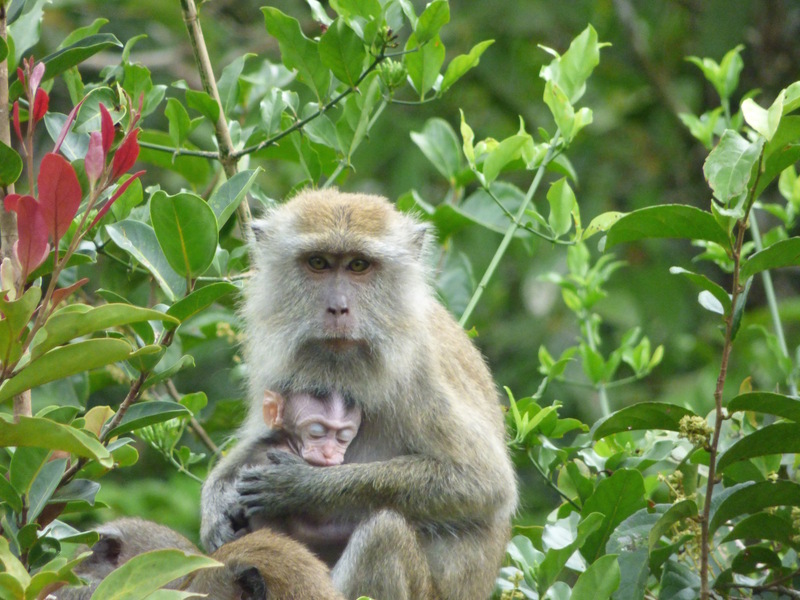 They have had mixed results — only three births so far. 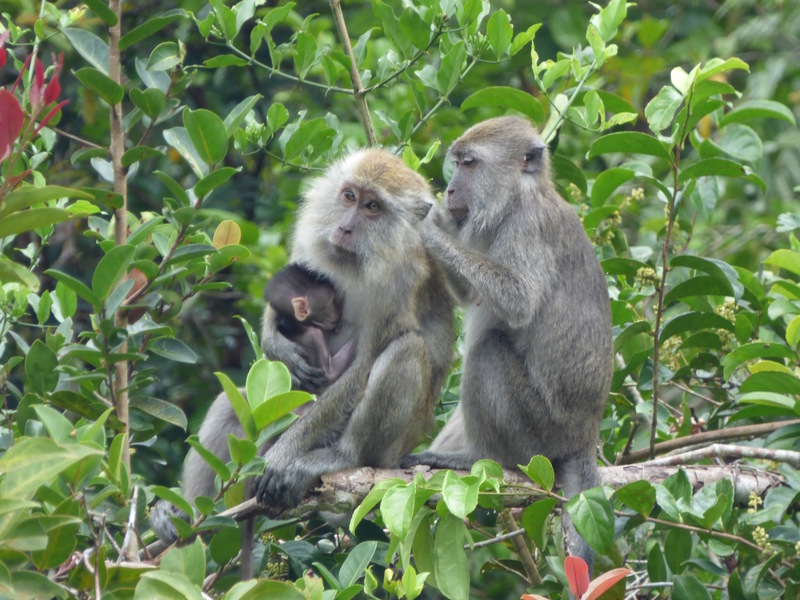 With instructions on what not to do – no flashes on cameras, no sudden movements or noises — we watched one of the “residents” devour bananas, branches, brush, almost everything in sight in his protected compound surrounded by an iron fence and electric wire. 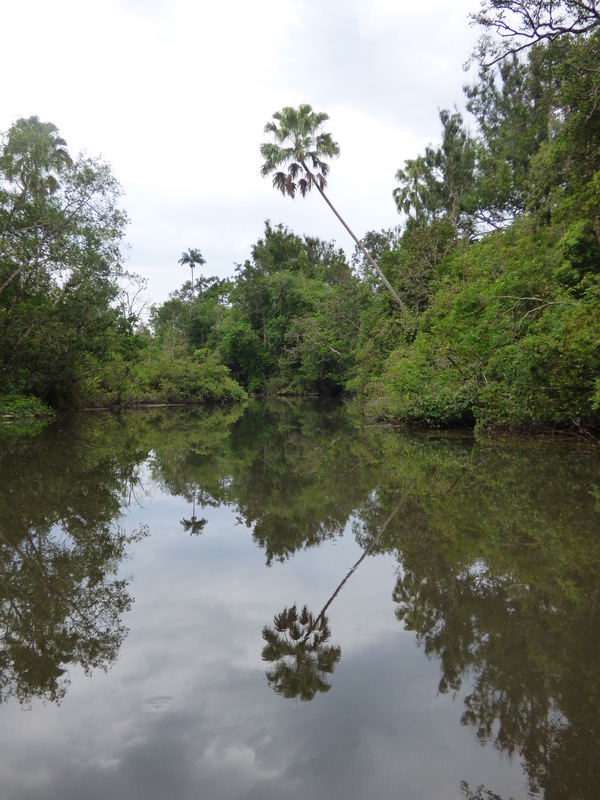 After the Rhino Breeding Center we visited an elephant hospital, then took a slow boat ride up a jungle river to look for wildlife, including monkeys, blue herons, kingfishers, and fish eagles. Some of our group with especially good eyes spotted a couple of crocs slithering into the water. At the end of the day we made our way to the Grand Skuntum Hotel in Metro (the actual name of the city). Despite its unpromising name and the fact that the hotel is described as “sharia” (no alcohol, hookers or unmarried couples) it was reasonably comfortable, once we managed to change our original dungeon, I mean room, for one with a window. 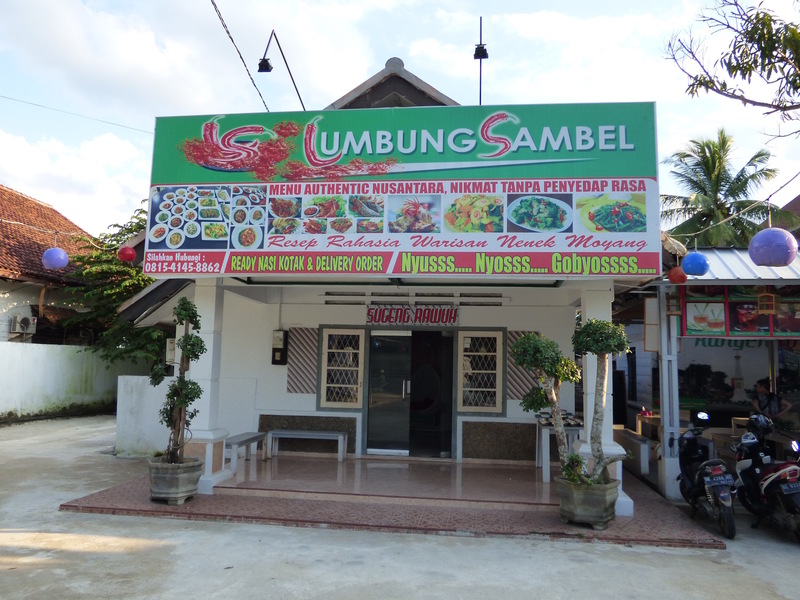 The next day we had lunch at Limbung Sambal, a short walk from the hotel. This restaurant was a real surprise. It wouldn’t have been out of place in the hippest neighborhoods in any major city in the US. 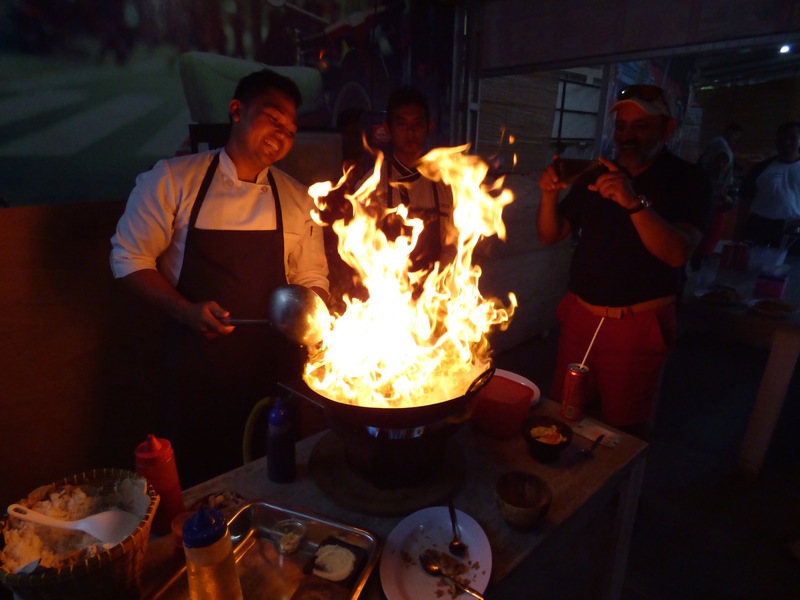 The chef and owner, Luthi Baihaqi, cut his culinary teeth at the fancy Novetel Hotel in Lampung, then spent a few years with the Royal Caribbean Cruise Line. 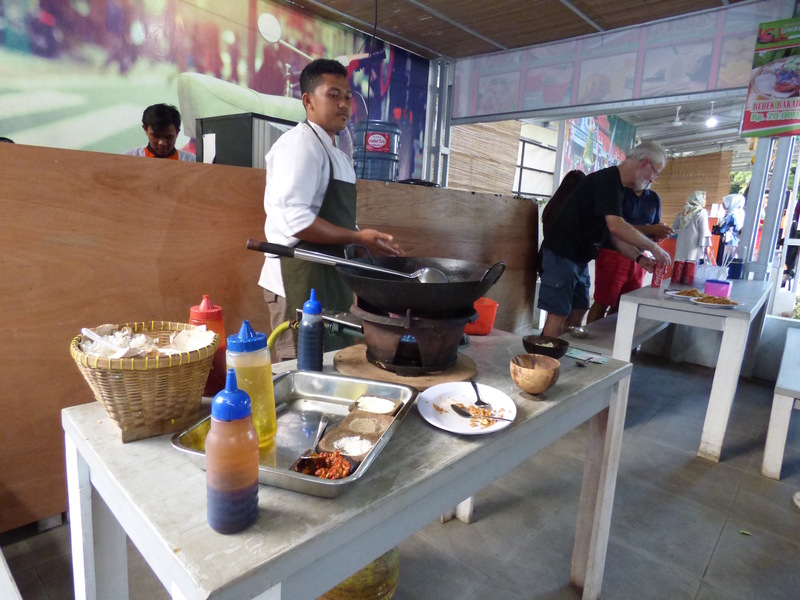 Dish after dish, including a sambal (spicy) version of the grilled fish we had on Lake Toba, appeared on our table. 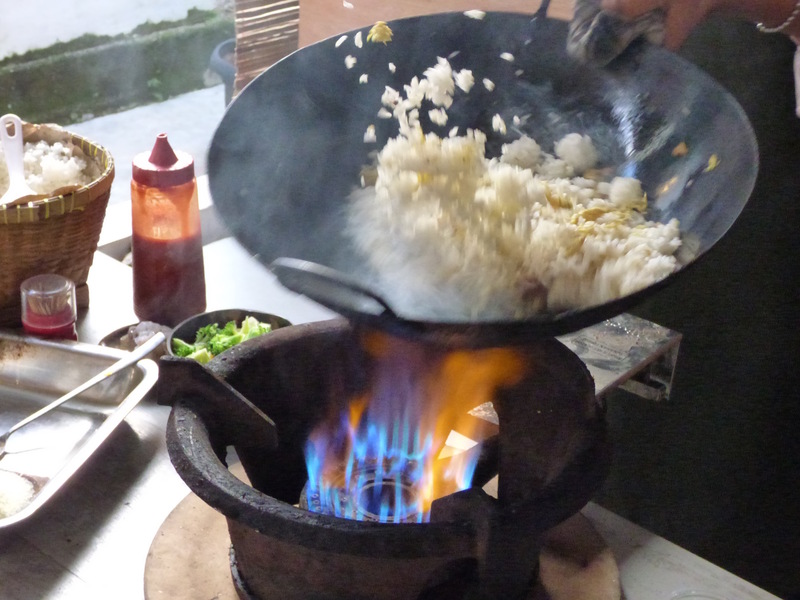 The lunch was so good that our guide scheduled a repeat performance that evening for dinner, after a cooking demonstration from the chef to show us how he makes the Indonesian favorite Nasi Goreng. We filled the rest of the afternoon with naps, chillin’, and a walking tour of the market, mosque, and the bustling heart of Metro. Following the cooking demonstration and dinner it was back to the Skunkum for some after dinner activity that did not involve booze or hookers. In my case it consisted of brushing my teeth and reading a few pages of my book before falling asleep a few minutes after 9. 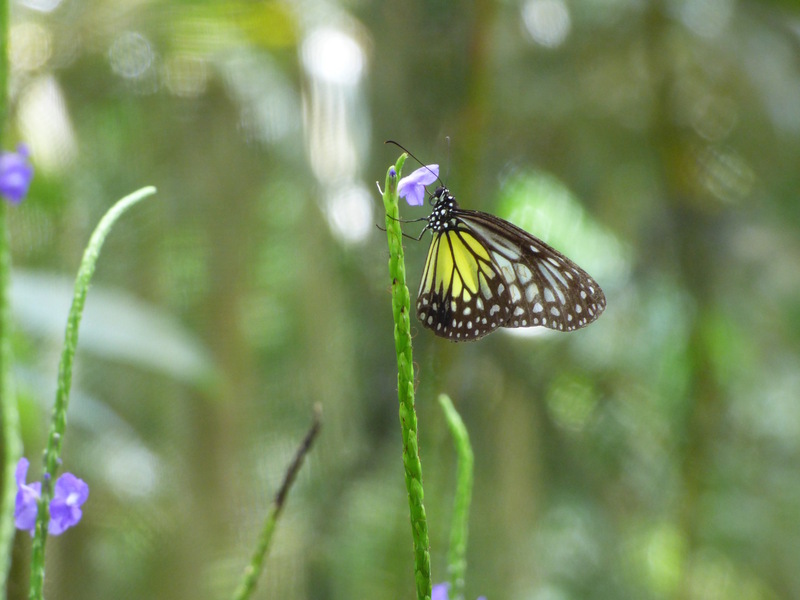 We wrapped up the trip with a last night at the fancy hotel in Lampung, a visit to a dusty local museum with interesting if neglected exhibits, and to a butterfly park on the outskirts of the town. It was a fascinating trip, but I’m glad to be home. 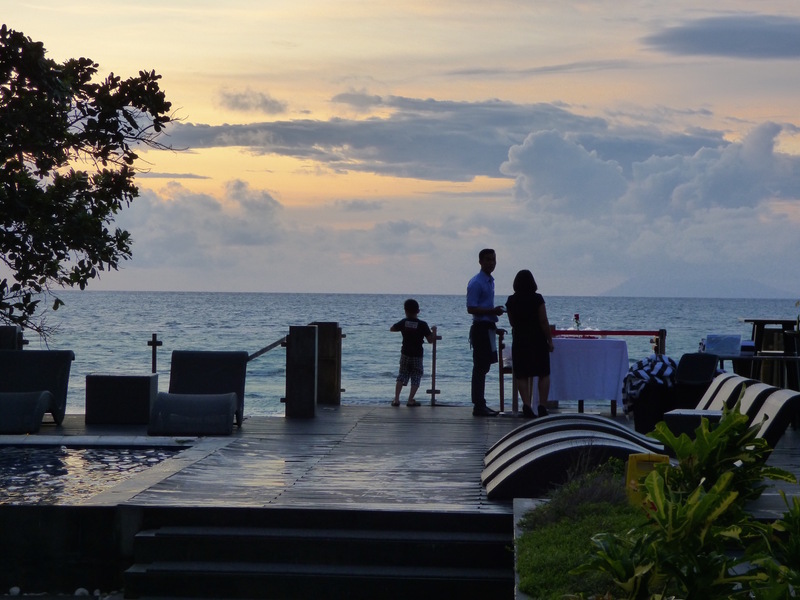 I’m sure that at some point the sultry mystique of SE Asia will draw me back once again. But until then I’ll be content to sit on my sofa watching the latest series on HBO. Plus, I won’t be sweating, and I will have a much broader range of beer from which to choose. 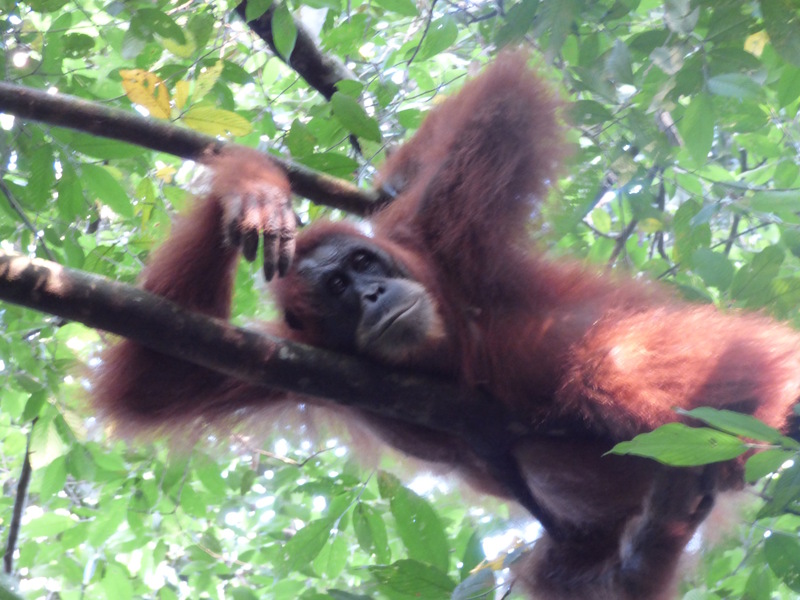 This entry was posted in Asia, Sumatra, Travel by admin. Bookmark the permalink. What a pleasurable blog! I feel I’ve had a fascinating trip without the sultry and interminable drives. Nice to meet your wife, too. Its great to hear from you, Robin.Sorry for taking so long to reply. Its been a very busy few months.